or print the deals below and redeem these offers at Pump It Up of Chino Hills, CA. Book your party Saturdays or Sundays for the month of April and spring into savings! The Spring BLOWOUT Deal is a 2-hour party for up to 24 kids and includes: 4 lg pizzas, 24 juices, a 1/2 tray of salad, and glow in the dark for up to 2 arenas! Saturdays for $299 and Sundays for $249! THAT IS HUNDREDS IN SAVINGS! BOOK TODAY! Book your party any Friday from now until April 26th and SAVE! Your $249 party for 24 kids includes: 24 juices, 4 lg pizzas (ch/pep), 1/2 tray of salad, and glow in the dark for up to 2 arenas! Valid at this location and for dates listed only. For new reservations only! Can not be upgraded to from previously booked packages. Cannot be combined with any other offers. 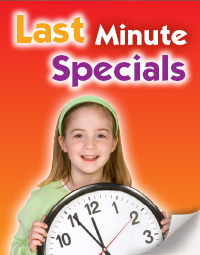 Book Saturdays or Sunday before noon or after 6:00pm and save! With the Keep It Simple 24 for $199 you get a 2-hour private party for up to 24 kids. THAT IS A SAVINGS OF OVER $200! THIS PACKAGE CAN NOT BE COMBINED WITH ANY OTHER DEALS OR SPECIALS. VALID FOR NEW BOOKINGS ONLY. CAN NOT BE UPGRADED TO BY A PRE-EXISTING RESERVATION. VALID AT PUMP IT UP OF CHINO. Book any Sunday for the month of MAY & SAVE BIG! Your 2 hour party for 24 kids includes: 4 lg pizzas, 24 juices, 1/2 tray salad, and glow for up to 2 arenas for only $309! $150 IN SAVINGS! Valid at this location and dates listed only. Cannot be combined with any other offers. Valid for NEW RESERVATIONS ONLY. Cannot be upgraded to from previously booked package. Host a party on Mother's Day, May 12th, and get a deal that is sure to be a gift for her! Mother's Day Special for 24 kids includes: 4 lg pizzas, 24 juices, and glow for up to 2 arenas for only $249! Valid at this location and date listed only. Cannot be combined with any other offers. VALID FOR NEW BOOKINGS ONLY. Can not be upgraded to from a previously booked package.